Safaricom is Kenya’s largest mobile operator with approximately 80% of the market. Most people don’t know this, but they get hundreds of business and technology proposals each week from people all over the country – techies and non-techies alike. It was with this problem in hand that they decided to open up an “Innovation Forum” for Kenyans to share their ideas. Safaricom is now back to the drawing board. Their problem hasn’t gone away, they’re still overwhelmed with emails, letters and proposals for business ideas that might/might not make sense for them to engage on. Wadzanai Chiota-Madziva heads up their VAS (value added services) department, and is in charge of this. After the noise caused by the less-than-stellar launch of the Innovation Forum, she and CEO Michael Joseph met with one of the techies who was very concerned about the way they were handling this: Al Kags. Al Kags has sat down in a couple of meetings with them thus far, finally he suggested a board that could serve as a buffer between Safaricom and the people sending in proposals. The Innovation Forum Board’s job would be to speak for the community to Safaricom, as well as push for better access to APIs, a developer sandbox and possibly and app store. They would also be responsible for helping to translate Safaricom’s position to the community. I was invited, along with some other’s from the tech community, to sit down and discuss this with them last week. It was a fruitful discussion about the possibilities and the roles and responsibilities that the board would have. Some of the discussion was about the need for a buffer to be created between Safaricom and submissions to foster fairness and openness, to provide confidence to developers to innovate without fears of intellectual property (IP) misappropriation. Facilitate understanding of Safaricom position with the developer/innovator community. The people invited for the meeting, as the potential board, were Moses Kemibaro, Jessica Colaco, Al Kags, Karanja Macharia, Rehema Parmena and myself. While it is up to Safaricom to decide who is on their Innovation Forum Board, those of us at the meeting pushed back a little on how they had done this. If they want to interact with the community, it might behoove them to reach out to that community for some of the nominations. 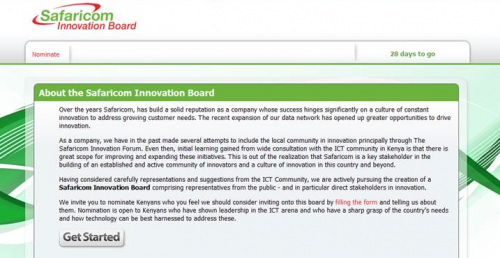 They listened, and starting today going through the end of the week, you can make your own nominations for the Innovation Forum Board for Safaricom to review on the website. This is your chance to put a name in of someone that you think would represent the community well on the board. Great, will send in nominations asap! we nominate you Erik. you need to continue the good work you are doing for the community. This kind of responsiveness is what keeps Safaricom ahead of the pack. Turning most hostile situations and challenges into opportunities to impress. The innovation board is an innovation in itself – Good luck to all those who will be in the board! Great Work Kagz and Erik collectively, especially introducing this anonymous and ubiquitous nomination process. One question though and excuse me if in my ignorance I didn’t see it or read it. Are there pre-requisites for being nominated or nominating folks? For instance do nominees have to be local? Do they have to have fit a certain standard of experience or academic compliance? Or is this process going to accept all people from all walks of life and experience? Just checking to see how we can submit folks – there may be a lot of unsolicited intellect/intellectuals sitting outside Kenya that this board can tap into if the structure is built in such a way that it allows that to happen. I wish to nominate Francis Okong’o a simple Kenyan representing the common kenyan man, who struggles to make ends meet and whose daily purchase of “bamba 10” contributes to the enormous profits of Safaricom… I think he will represent the real community. @Leo – The pre-requisites seemed to be someone that is active and doing something in the mobile tech space, located here in Kenya. Wacha nikuulize, hii ni application ya kazi, ama ni kura watu wanatafuta? is this a job application process, or an election process? It’s a nomination process, from which Safaricom will choose. Just wondering if there are any updates on this. I just realized something, reading stuff on Google Reader comes with a penalty. I seem not to comment as much as I used to before I turned to it for my aggregation.